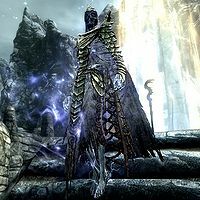 Nahkriin is one of the eight high-ranked dragon priests in Skyrim, and is encountered in Skuldafn, a temple you visit during The World-Eater's Eyrie. Nahkriin, like the other seven dragon priests, has a mask with considerable power, as it gives 50 more magicka points and a 20% reduction on spell cost for Destruction and Restoration spells. Nahkriin wields a unique looking staff with a powerful Wall of Storms attack. The staff must be used to open the portal to Sovngarde and therefore cannot be kept. Upon noticing you, Nahkriin will say "Zu'u uth nall [sic] thurri dein daar miiraak." During combat he will taunt you with the following phrases: "Fent ni filok. ", "Hin laas los dii. ", and "Sosaal fah hin vothaarn." His name means "vengeance" in the dragon language. If you want to obtain Konahrik, make sure to grab Nahkriin's mask as soon as you defeat him. You cannot return at a later time to get it, but PC players can use console commands to avoid fighting him but still acquire the mask. He might sometimes not be at full health when reached. What drains his health prematurely? Can he die before he is engaged in fight? He appears to spawn with exactly 50% health (745). See the discussion page for more details. Nahkriin also appears as a card in Legends. This page was last modified on 24 January 2019, at 16:24.